The first time I ever read about someone making a meal of potatoes was in our Co-op newsletter many years ago, long before I became vegan. My friend Gary MacFarlane, director of the amazing organization Friends of the Clearwater, wrote a delightful article about how he and his girlfriend disagreed about the best way to make a meal of potatoes. I enjoyed the playfulness of the article, and the notion that one could live on potatoes stayed with me. I was reminded of it again later on when one of the environmental activists living in Moscow during the Cove-Mallard campaign was ahead of me in line at the check out counter. As she waited to buy potatoes, cilantro and green onions, she said those 3 things together were her favorite meal. Now that I’m vegan and have spent so much time learning from folks like Dr. McDougall, I know the pleasures of eating potatoes as a centerpiece of my meal first hand. My favorite potatoes are Yukon Golds. A long time ago, I went to a naturopath who muscle tested me for all kinds of food, and she said that Yukon Golds were the only potatoes I should eat. I don’t know how accurate that is now, but I do know they are still the ones I like the best and digest most easily. 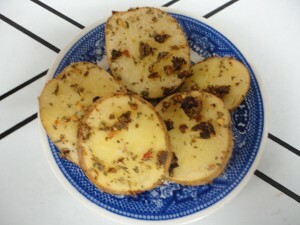 In Potato Pizzas I Have Loved, I showed you a variety of ways I’ve taken Susan’s Potato Pizzas to innovative heights. But it wasn’t until recently that I remembered my Uncle Danny’s authentic pizza from my childhood, which had no tomato sauce or anything resembling cheese on it, as we Americans like to think of pizza. Instead it was a baked thick crust, lightly brushed with olive oil and dusted with herbs like basil, rosemary, oregano, salt and pepper. It was fabulous, and secretly I liked it better than anything loaded with tomatoes sauce and cheese. Of course I kept that a secret because who would have believed me? But the simple combination of those roasted spices on homemade “crust” was magical. Sometimes in midwinter I start feeling sorry for myself that I can’t digest the traditional breads others can eat very well. A few weeks ago I was buying spices in bulk at the co-op and came across Frontier’s Pizza Seasoning (no salt added). I read the ingredients and suddenly I just had to buy it, though I wasn’t sure what I’d do with it. Would I break down and make a gluten-free pizza crust? I thought I might, even though that’s not the best idea if I’m not going to share it with others. But when I got home I remembered I had 3 yukon gold potatoes that had been waiting for me to do something with. And that I love the taste of potatoes tossed in my nasturtium infused white balsamic vinegar . 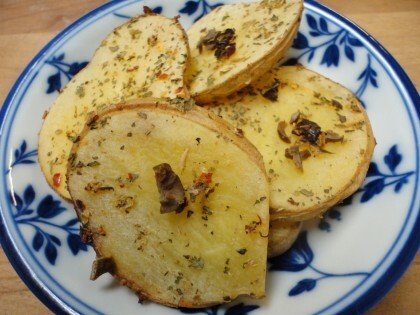 .. and that the pizza seasoning might be really delicious on them tossed in. . .so I made the same potato slices I make for potato pizzas, but instead of a lot of toppings, they got this very simple treatment–and the result was delicious. Sometimes simplest is the best. And with a big salad full of veggies and a handful of beans, I had a very hearty winter meal. Makes one generous serving, so if you’re feeding others, multiply accordingly. Preheat the oven to 350. Slice the potatoes lengthwise in slices about 1/4 of an inch thick (actually, I don’t measure, but not really thin but not really thick either). Put in a medium sized bowl and toss with the pizza seasoning vinegar, and olives. Mix it for a few minutes so the potatoes slices get well coated with everything. Lay them on a cookie sheet lined with a sheet of baking parchment. Bake for 40-45 minutes. No need to flip them over mid-way. Here are the ingredients of the Pizza Seasoning I happened to use. You can certainly make your own with what you have on hand. Organic dehydrated onion, organic fennel, organic oregano, organic basil, organic dehydrated garlic, organic bell peppers, organic chilies, organic marjoram, organic parsley, organic thyme. When I use the olives in roasting my potatoes this way, I like to rinse some of brine off. Also I use the old-fashioned Dr. Swank way of counting their fat: he would say 6 green olives equal 5 grams of unsaturated fat, so 3 of them equals 2.5. I figure these olives into my fat ratio for the day. It’s inevitable that some of the seasoning ingredients are going to be left in the bowl. To me, this is the perfect opportunity to make a salad to go with the potatoes slices. I remember the first time I grew yukon gold potatoes in my small garden. Finding them in the ground was literally like digging up Easter eggs. I was thrilled with each one, and removed them as carefully as if they were delicate artifacts at an archeological site. In honor of the magic of food that grows in the earth like potatoes do, I’d like to leave you with a passage or two from the most beautiful words written about potatoes I’ve ever read. They come from The Singing Creek Where the Willows Grow:The Mystical Nature Diary of Opal Whitely. You can read a little more about Opal in this overview from the New Yorker, but to summarize, she was an exceptional child living in a series of Oregon logging communities in the early 20th century. She kept a diary with crayons and scraps of paper given to her by neighbors about her incredible relationship with the natural world around her. Beautiful and heartbreaking, she often wrote while being placed under the bed as punishment for her “daydreaming” and her tendency to go on what she called “explores.” It’s like nothing else I’ve ever read, and is now one of my favorite books. Here’s some of what Opal had to say about the potatoes growing in the field around their house near the woods. I like to think that if Opal and I were to have known each other at any age or in any time, she would have liked my drawing “Listening to the Earth.” When she was a girl and a young adult, she taught many children how to know and appreciate things in nature. Her diary was published to great acclaim until some accused her of being a fraud (the mysteries surrounding her life and writing are controversial to this day), claiming no child could have known and written what she had, and it went out of print. She lived a very difficult life and only toward the end of it were people beginning to understand her gift and revisit what she had indeed written. By that time, though, she had long been institutionalized for schizophrenia. It’s hard to be sure from conflicting accounts how much she knew about the reviving interest in her early writings. When I eat my simple and delicious potatoes her words help remind me not to overlook the beauty and depth in what is right under my nose, and to believe in my appreciation of these things. We should never underestimate the magic of being alive. Now when I slice my potatoes, thanks to Opal Whitely, I will always think of them as dressed in brown dresses and full of the songs of stars. And for those among us more focused on football than nature mysticism, I do also believe these potato slices could make some mighty fine Super Bowl snacks. I had to order the book! I love the way you write and connect life, literature, art and food. Thank you, Silva! And so fun you ordered the book too! It’s easy to get as hooked on the mysteries of Opal’s life as it is to be charmed by her strangely beautiful writing. Enjoy!! This is one of my favorite ways to make potatoes! I’m snowed in right now and have a bag of Yukon Golds in the refrigerator for another dish I planned to make but I’m missing a key ingredient. Because I can’t drive anywhere, I think this would make the perfect substitute. And thanks for the reminder about that book. When I first found out that the “biographer” is the same person who wrote the “Tao of Pooh” and “Te of Piglet” books I’ve been meaning to order it. I *just* bought it now before writing this comment from Half.com for 75 cents plus postage. I do wish Mr. Hoff gets over his hatred of the publishing industry and starts to write again. That is a fantastic idea for a meal!! I think I will make that tonight or tomorrow. 🙂 And I love your description and excerpts from the book – I had never heard of it, but will look for a copy! Brown dresses and kind stars are wonderful imagery. Thank you for sharing. Thanks, Veronica! I hope you like them. They are easy as can be. I first heard of Opal Whitely at poetry night, an got intrigrued. I’m glad you enjoyed the excerpts. Maria: if you can find it again on McDougall, try to listen to the Advanced Study Week-end presentation by the president of the potato commission (I think Washington State). It’s very fun and informative-it was his 60-day potato “fast” to prove the high nutrition of the potato. It’s a free listen. I love the recipe moon watcher. Oceanfrontcabin, though potatoes have nutritional value I personally would over eat potatoes. Potatoes to me are a food to eat in moderation because of their particular starch content and high glycemic load. Thank you for your comment, Aqiyl. I think you mean you would not overeat potaotes. Those of us trained in the McDougall way of eating follow evidence that potatoes are fine in any quantity. You could find out more about that on Dr. McDougall’s site. It’s really up to each person to explore the options and the conflicting evidence and decide what is right for him or herself. Thank you for sharing your perspective with us. Yes sorry I meant I would not overeat potatoes. Thanks for the catch. I do study McDougall and I agree with a lot of what he says, but a few things I don’t totally agree with, through my own experiences. I am a carb lover and I support a high carb diet, I just feel some carbs and complex carbs are better than others. Because of the complex carb structure of potatoes and it’s high glycemic level I stay away from them. I am a highly active person (boxer, cyclist, runner) and I personally see that they slow me down. I don’t feel they are the worst thing to eat, I just don’t find them to be the best. I love McDougall’s work though. Thanks for your clarification Aqiyul, and good information to consider, since everyone is unique. It’s wonderful you’ve found what works best for you. Glad you are following along here! Previous post: And The Winner Is. . .